Here's the next in the series of profile pieces with the Chosen Ones who have been enlisted by Mimir the wise master, to save our universe from the evil Shaitan. 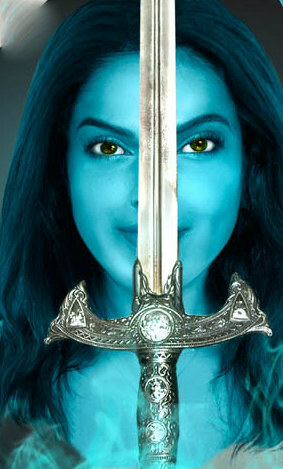 Next up is TIINA Yadav, swords warrior, Chosen One. Tiina? Is it just Tiina or do you have a surname? I have always preferred to use just my first. As the stories go, for a very long time even the gods only answered to first names. They never did have surnames. Its kinda intriguing to have only a first name, don't you think? How would you describe yourself? That's a tough one. Yudi calls me a free spirit, but Rai says I am just too impatient. I can never resist a dare, if someone tells me not to do something, well I've just got to give it a shot to find out why.... It does get me into a lot of trouble I can tell you that! What is your problem in life? Political? World Peace? Hey that's way too serious a question. In one word I think its men! Can't do with them, can't do without them. Who do you normally hang with? Since I met Artemis, my cool shape-shifting spaceship pal, she's been my constant companion. She doesn't like it when I try to talk to her about Yudi thought, I wonder why? Are you in a relationship? Yudi is my childhood sweetheart... and typically he always knows just how to hurt me. Rai's definitely my BFF. He's always there for me. I'd love to visit his birthplace Bombay... perhaps there I'll find a home to replace Ka Surya. And who do you love to hate....? It would be so easy to say Shaitan... Don't get me wrong, he is my nemesis in many ways. I am just waaay too upset with Yudi--why can't he just pick up his sword and fulfill the prophecy of Shaitan being killed by his son--Perhaps its time I took matters into my own hands. Any message for your fans? Look out for the next book in the series, Return to Seven Islands. I promise more romance and if you thought Shaitan was evil...well you ain't seen anything yet.